When it comes to bathtub installation there are many details & costs. We rounded up all of these in our bathtub installation cost guide! In the past, bathtubs used to be a symbol of luxury and high-end living standard. Nowadays, the bathtub is something that almost every home owner has in his bathroom. Today’s bathroom has become way more functional than it was few decades ago. Spa, therapeutic experience, a place to refresh your body – and in the heart of all this is the bathtub. There is no better thing than relaxing for half an hour in it after a long day. But before such nice moments can happen, there is always that time when we should carefully choose the appropriate bathtub for the style and characteristics of the bathroom, consider all the required costs, manage the installation process and take care of the its further exploitation. The material from which the bathtub is made is one of the main factors that determines its cost. On the other hand – the shape in which the bathtub is produced is decisive for the comfort of your future baths. Bathtubs come in many different shapes and dimensions and can be produced with different types of materials. Of all the listed materials, acrylic can be defined as the most preferred one. It is a long-term, durable and resilient solution, which can be produced in various soft contours. The colors in which the bathtub is produced are long-lasting with amazingly glossed surface and texture. Acrylic bathtubs are resistant to chemicals, mildew, thermal cracking, high temperature and UV lights. Its light weight and lower price are other pros which account for its popularity among customers. Fiberglass bathtubs are another option if you are aiming for the low-to-middle price range. This types of tubs are strong and light-weight. A major disadvantage that you should take in mind is the fact that they are not so durable and long-lasting because their surface can be affected by stains and mildew. Fiberglass bathtubs are vulnerable to crazing and formation of spider cracks. Enameled cast iron, also known as porcelain are the most durable among all. They are also the heaviest and because of that, they usually require additional floor reinforcement. A typical issue with such bathtubs is the fact that they require continuous hot water supply for them to maintain the desired temperature. The structure of the cultured marble bathtubs provides them with many advantages. Formed by a mix between crushed limestone, fiberglass particles and gelcoat finish, these bathtubs are a beauty to watch. But bear in mind that when the gelcoat of the tub is compromised, then the porous body of the tub will not be easy to maintain. A useful tip when considering to buy such type of bathtub is to take a look at its underside – if there are many bubbles, that means in future, you will have troubles to keep the tub clean. Cultured marble bathtubs are not cheap and that is why you should not make any compromise with their quality – choose only certified and trusted producers. Customers who has the budget to invest in the high-end price range usually choose bathtubs from natural materials. These tubs are made from various materials – from glass, granite and onyx, to wood, copper and more. Choosing such product will require building the whole bathroom design around it as it will be the focal point of the room. If these bathtubs are maintained accordingly, they will last for a very long period of time. No matter what material for your desired bathtub you choose, it is the careful and continuous maintenance that will be decisive for the comfortable exploitation of your bathroom. These are the most traditional and widely-used on the market. They are the so called “bathtub standard”. They are ideal for taking long baths, showering your kids or your pet and other familiar tasks. They are also the cheapest ones starting from $200 and, depending on their material, shape, size and color, can cost you up to $700. As their name suggests, these bathtubs allow you to place your full body under water. This type is the favorite of those who love laying in the tub for hours and relaxing with a cup of coffee, wine or a nice book. This type is also very affordable as the price range varies from $300 up to $7 000 depending on the tubs characteristics. These are intended for elderly or hardly-mobile people. Their design allows you to get in the through a door-like panel without the need to climb over the tub’s side wall. Do not worry – there is no chance for water leakage, as the door-like panel is very well insulated, comfortably sealing the inside panel of the tub, once it is closed. Understandably, these tubs’ prices start from a higher base ($1500) and can cost you more than $10 000. 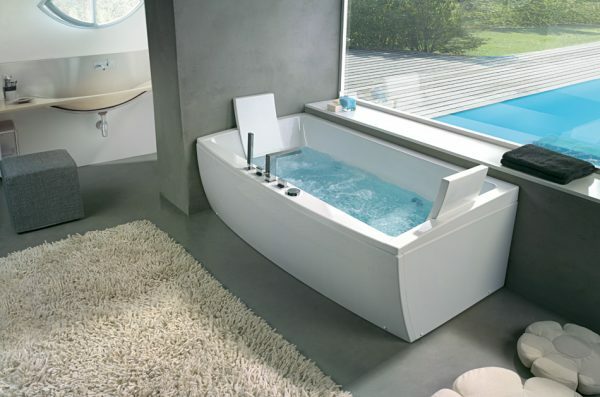 This is the premium type of all bathtubs as it provides the “spa-like” functionality. It is ideal for massages and therapeutic procedures. When it comes to the price range, the whirlpool bathtubs can be defined as the most expensive ones. Although you can get such tub for approximately $700, the average price for a good-quality product starts from $1500 and can soar up to $13 000. If there was a bathtub installed previously, then you can decide to place the new one on the exact same place, using the existing installation components. This will be the easier thing to do as the only thing that you should bear in mind is the shape and the size of the new bathtub – they must be exactly the same as the old one’s for the new tub to fit smoothly. But if you are willing to go through a complete bathroom redesign or you are entering your brand-new, freshly finished home, you must take some time to figure out the best place for your bathtub. This bathtub configuration is the most popular one as it fits between three walls, allowing access via only one of the tub’s sides. It is very useful for bathtub and shower combination. If you want to choose this one, bear in mind that it requires the bathtub to be installed on a platform or additional base so that it gets additional stability and all other components can be easily integrated and masked behind that deck. Usually more suitable for high-end bathtubs, the undermount configuration is very much like the drop-in one, but lacks that platform which highlights the effect of the bathtub to act as the main detail in the bathroom. This type of configuration is usually used for bathtubs with claw foots or flat bottoms. It allows the bathtub to stand alone without any support. Another very popular choice, Ideal for the effective use of every single inch in one of the sides of the bathroom. It can also be a combination of the types mentioned above. As some of the configurations are obligatory for the placement of the bathtub (for example – the corner and the alcove), the other types let you choose the most appropriate place for installation. According to expert, the most popular place for a bathtub is in the far-end of the door. 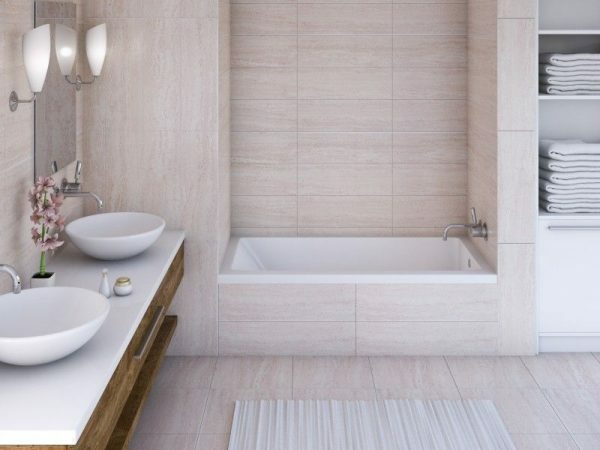 But if you have decided to invest in a high-end bathtub from wood, stone, marble or other expensive material, you would definitely want to build the whole bathroom design around it. Choosing such premium bathtub, naturally requires for it to be placed in a central area as it will serve as the main detail in the whole room. Most of the time, such bathtubs are designed without an existing shower standing over and with a very well-integrated faucet (often in a minimalistic style to preserve the natural look of the bathtub). The fact that such kind of bathtubs designed as simplistic as possible does not bother their functionality – you get an amazing-looking and comfortable bathtub. This step is as important as the type, design and quality of the chosen bathtub. There are cases when you can try doing it yourself, but if you have invested a large sum in a quality bathtub or you will have to deal with shower integration, tub platform installation or other tricky tasks, the best thing to do is to find a good team of plumbers to execute the process. Bear in mind that sometimes even easier issues such as connecting the water pipes can become risky for the future exploitation of your bathtub. As the bathtub is a long-term investment, it may be better if you contact a licensed professional. It is recommended that the bathtub installation starts after all other construction or renovation processes are finished as it is usually the last touch in the bathroom design. 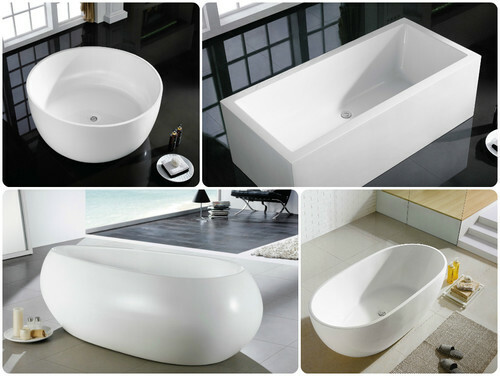 Just do not forget that every detail should be executed in accordance with the bathtub design, shape and size. Does he need to deal with the existing installation of the hot and cold water pipes? Is it necessary for the drain pipes to be remodeled so that they can fit the new bathtub (if its dimensions differ from the old ones)? Installation of the new tub according to its type and characteristics. Connecting pipes for waste water. Need of construction work like building new side walls, tiling and grouting, waterproofing, floor reinforcement (in case your new bathtub is heavier). The average hour rate that a licensed plumber charge is in the range of $45 – $65. Bear in mind that the plumber may require a minimum charge (depending on the project) which can account for up to $250. If your new bathtub has some more advanced features (therapeutic for example), you will need to hire an electrician also so that all the installation will be handled accordingly. This can cost you up to $80 per hour. As previously mentioned, a good bathtub can cost you a lot of money. That is why the most important thing to bear in mind after the bathtub is installed, is how to take care of it and preserve its initial vision. There are numerous types of products that can help you sustain the beauty of your bathtub. But when it comes to making a choice, the first thing to consider is the material from which your bathtub is made. Thus, you can then make a well-informed decision about the relevant type of cleaning product that you should choose. Acrylic Use only soft cleaners and avoid abrasive ones. Common thing for the acrylic bathtubs are the marks, formed by the water that sometimes may remain after taking a bath. They should be wiped out only with a cloth. The long-term exploitation of such tubs may compromise their finish. Nevertheless, unlike the cast iron and fiberglass bathtubs, the finish of the acrylic ones can be easily restored. Fiberglass You can use abrasive cleaners but carefully, without much pressure as it can result in spider cracking. Cast iron As most of them have a “non-skid” surface on the bottom, they can be very hard to clean. Nevertheless, the usage of mild cleaners or liquid detergents is considered the best choice. Do not try abrasive substances as they will harm the shiny look of the surface. Stone Depends on the type of the stone. A good practice is to impregnate the bathtub once in a while so that you can refresh its look. Wood Avoid aggressive chemicals and abrasive cleaners as they can damage the finish. Depending on the product specifications, the price range for the high-quality cleaning materials is between $7 and $20. No matter what type of material is your bathtub made of, there is just one significant rule – clean the bathtub at least twice a month. That way, you will be able to preserve the good look of the tub as you will minimize the chance for stains and mold to form. Some of the materials, such as the cultured marble for example, are stain-resistant. But others are very vulnerable to mold formation. If there is no appropriate maintenance, this mold can penetrate the finish of the tube and spread inside it which will make the process of restoring the initial look of the tub, very difficult or even impossible. Many people prefer to renovate their existing bathtubs because they are valuable (most of the existing old bathtubs are made of cast iron), well working with proper installation or beautiful with good shape that fits the bathroom design. In recent years, the bathtubs renovation was significantly improved and now it can almost completely restore the initial, fresh look of your bathtub. The process starts with a removal of the existing finish of the bathtub. Then various chemicals are applied to form a stable finishing coat. The surface is then colored and carefully polished. During the renovation process, the bathroom is constantly vented for the toxic fumes to be released. The cost of the renovation process can vary depending on the size, the color and the type of your bathtub, but on average, you will need to set aside $300 to $800. There can be different reasons for you to experience the need of replacing your old bathtub – it doesn’t fit your design idea, you plan a solid bathroom redesign, the tub is damaged and etc. But what about the cost of removal? The answer is that it is dependable on different factors such as the type of the old tube’s installation; whether the new one fits in the same place or needs some additional work; is there a need of floor reinforcement so that it can handle a heavier bathtub and etc. There may be various reasons for the replacement of the existing bathtub to become complicated. One of the most problematic scenarios are connected with the installation of a bathtub in an alcove because of the dimensions of the existing and the new one. For example – if the old one is bigger than the new one, the installation process will then require filling the gap between the side walls and the new bathtub. If the new tub is bigger than the alcove’s size, then it is important for the side walls to be remodeled, so that the new tub fits in smoothly (just be careful not to choose way bigger tub). Removing the old tub from the alcove may reveal some further problems with the existing components. You may witness existing mold, spider cracks, damaged concrete (or other material) – all due to a water leakage from the installation, structural instabilities and etc. These should be repaired immediately, because you do not want to risk the comfortable exploitation of your brand-new bathtub. Another widespread issue with the removal of existing bathtubs is the damaged floor underneath. If it is tiled for example, it is very important for you to check the structural stability of the floor, so that if there are any unstable or cracked tiles, they can be replaced. Thus, you will ensure the stability and seamless maintenance of the new bathtub. An important point to be considered is the plumbing process. When replacing the old bathtub, you must be prepared to set aside some budget for new pipes because of the fact that the existing ones may be damaged or not the right size to fit with the project for the new tub. When choosing the new pipes, the chance is that you buy either copper or plastic (PEX) ones. The PEX pipes are the most-widely used because of their flexibility, cost efficiency (1/3 of the price of copper pipes) and durability. Unlike the copper pipes, the PEX ones are resistant to corrosion and are lot easier to install. They are very good at retaining heat also. So, overall, the PEX is the type of pipe that you will need and you can be pretty sure that the professional that you have hired to handle the job will know that. Many professionals prefer working with PEX pipes because they allow them to avoid cutting holes in the walls for installing the pipes as they are flexible enough and can fit easily. If you do not want to renovate your existing bathtub, but instead to replace it with a new one, it is useful to check whether there are models which will fit on the exact same place (this is in case you do not plan to redesign the whole bathroom). Avoiding walls redevelopment, plumbing and other similar processes, typical for the replacement of existing bathtubs will save you additional money which you can invest in further home improvements, furniture or whatever you need. 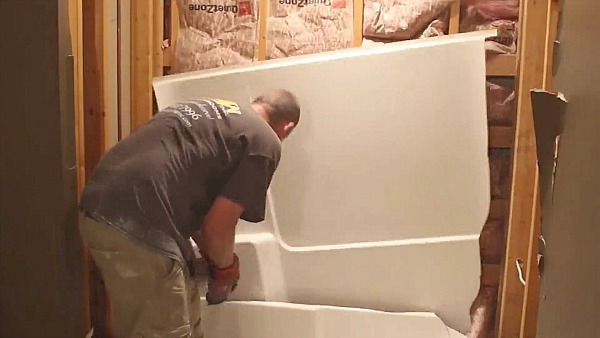 This is a useful tactic to follow because installing a bathtub to fit in an existing surrounding components usually makes the cost way higher than standard bathtub montage. If you do not have any specific design ideas and your only aim is to refresh the look of your bathtub, take in mind the benefits of renovation. Instead of buying a new bathtub, remodeling the walls and plumbing installation, handling additional tiling, wall reinforcement and other specific issues, typical for the process of removing your existing bathtub, it may be useful for you to consider the “refinishing”. Cheaper, easier and popular, the bathtub renovation process will cost $300 – $1000 on average and can is a suitable option for restoring the initial look of cast iron, steel and fiberglass bathtubs. If you would like to replace your existing tub, a useful thing to do is to spend some time researching the different materials, designs, sizes and shapes available on the market, so that you will be able to make the best-possible choice and ensure the comfort of your future baths. Consult a professional and read customer reviews as the bathtub, alongside with its installation, is one for the long-term. That is why you need to write your homework. After you have done your research, you can then easily go to the store and test your new bathtub. Get inside, stay for a while and feel the tub. This is a very popular thing and there is nothing to bother you. 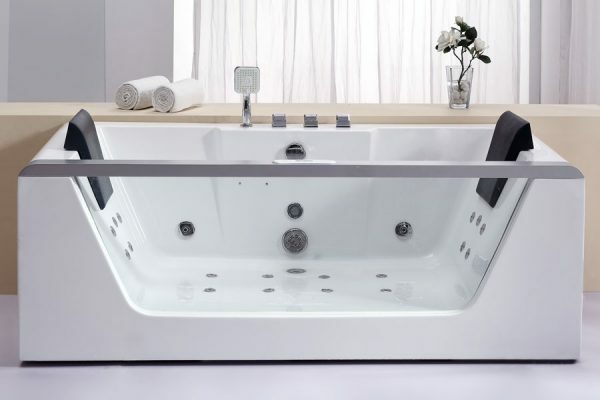 For comfortable exploitation of the advanced whirlpool bathtubs, it is useful to consider buying a model with such design, where about 60% of the size is dedicated to the water tank, so that the water heaters will be able to fill the tub with hot water in appropriate time. Also, it is important for you to consider the places of the jets. Some people have a preferred position in the bathtub and if the jets appear to be located in a zone which is uncomfortable for you, then this will potentially harm all your bathtub experience. If you are about to install a massive and heavier bathtub (for example – cast iron and stone models can be two to ten times heavier than traditional fiberglass or acrylic tubs) or your home is old and you are not sure about the structural stability of the floor, the most important thing before starting is the floor reinforcement process. The best thing that you can do here is to consult a professional, so that you are able to get an insightful advice and to be 100% sure about the reliable further exploitation of your bathroom. If you would like to set aside some money in case your floor needs reinforcement, you should know that such tasks may vary in the range of $300 – $800, depending on the type of the floor, the kind of reinforcement that is needed, the hour rate of the construction specialist and etc. Consider the bathroom building standards as there are regions where local authorities require having a permit before undertaking any work processes such as plumbing, migrating the bathtub and etc. The best choice for you is to hire a professional, who is knowledgeable and can ensure the smooth execution of all the work processes that your bathroom requires. Hire only licensed professionals. Most of the designers of bathroom equipment may decline to process the guarantee of their products if they are not installed by a licensed professional. Hiring such person may cost you from $10 to $40 per hour more, but you will be confident that all the needed work will be professionally executed and if something happens with your bathroom equipment in the near future, your guarantee will not be declined. This can have a significant influence on your final decision. For example – you may want to go there and buy the “everyday choice” – nothing special, just a working bathtub that will be useful in your everyday life. Or on the other hand – you assume that buying a bathtub is one for a lifetime and you should not bother spending a little bit more for better quality, intriguing features, new functionalities and etc. Defining what you want from your bathtub is important for choosing the right shape and design also. For example – if you plan to bathe your children in the tub, do not reach for a deep soaking one as it will not be a safe, nor practical choice. If your home is newly constructed, you will have additional flexibility in terms of your bathroom design and the choice of your desired bathtub. You won’t have to take into account previous bathtub’s characteristics, piping specifications and other issues. On the other hand – if you are about to redesign your bathroom, you should consider all current specifications unless you do not bother to invest more money for remodeling the whole room, the electricity installation, piping system and etc. The ergonomics of your bathtub is the most important thing to be considered. Remember that taking a bath should be a relaxing and comfortable experience. Read the technical sheets of the product and do a well-informed research. 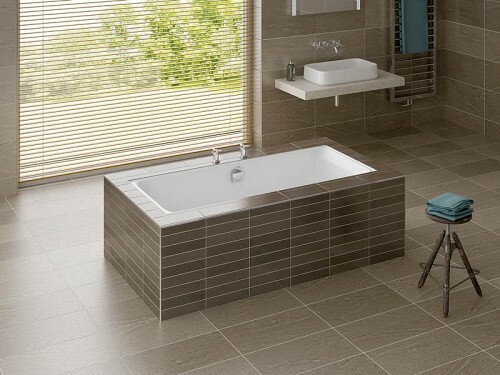 An expensive bathtub does not have to be comfortable for your body shape. Everything is individual and you should bear that in mind when purchasing. As you are already familiar with the fact that there are cases which may require floor reinforcement in order to be able to handle the weight of the new, heavier tub, do not forget to also add the weight of the water and the one who is taking a bath. Deep soaker tubs are very heavy and can hold a lot of water – for example, there are common product series of such tubs that have individual weight of about 150 pounds. They have also a water capacity of 100 gallons which is approximately 850 additional pounds. Add to that your weight and you have more than 1000 pounds of pressure on the existing floor. In such cases, it is better for you to contact a building engineer so that you can receive a professional advice on the appropriate floor reinforcement work that is needed. So, the average cost of such project for a typical USA household is $2500 with the new tub, the removal of the old one, the accessories and the labor included. This budget is estimated as a national average and can vary widely, depending on the cost of labor and products in different states. The sum can escalate if the type of the bathtub that is chosen a whirlpool one. The full spa experience that this kind of bathtubs provide comes at a costlier price. Just like the Jacuzzi-type, whirlpool bathtubs offer massage water jets, which is something that you simply cannot imitate with any other bathtub. The cost of such bathtub may vary but on average, if you want to ensure your home therapeutic zone, you will have to set aside from $1500 up to $13 000. Except the cost of the tub itself, you may experience the need to finance additional plumbing and electricity work, which will make the price go up with $600 to $1000. If you decide to choose a whirlpool bathtub, bear in mind that a need for a new electric panel or an update of the existing one may pop-up. Such type of work can cost from $1000 to $2500. If you are unwilling to pay such sums for a new bathtub, you can always stick to another popular option – renovation of the old one. As we have already discussed the different pros and cons, typical for such process, it is important to mention that renovating the old tub can restore up to 90% of its initial look. Such project will save you significant costs as the average price for bathtub refinishing varies in the range of $300 to $800. Bathtub installation is a specific process, which requires thorough planning and a solid investment of time and energy. If executed professionally, such kind of project can significantly transform your bathroom.